An outdoor kitchen can be a dream come true when you put in the time to plan for every detail. Everything from function and cooking equipment, to workstation flow and seating requires careful consideration to execute right. Developing a checklist can help focus your design, keeping you on vision. It’s important to remember your needs, so you don’t overspend or forget a crucial element of your dream outdoor kitchen. What kind of weather do you expect while enjoying your outdoor kitchen? It’s very important to consider what kind of weather and temperatures you might be exposing your outdoor kitchen—and its guests—to. Shade, a source of heat, and protection from rain/snow are the common weather obstacles you may have to contend with while enjoying meals. If you only plan to cook meals in the kitchen, and serve them in a separate outdoor area, then it may not be as important to equip the kitchen with certain amenities (i.e., umbrellas, heaters, etc.). Your first and primary consideration should be protecting your outdoor kitchen and its equipment, and making sure that you’re comfortable while using the space. Adding a heat source or installing some kind of covering, such as a pergola or canopy, can extend the season of using your outdoor kitchen, letting you get more out of the investment. How many guests do you plan to cook for? Where will they eat and sit? Although you should definitely plan your space according to how many people you’ll want to entertain on average, it’s more important to size it to your specific needs. Making a cozier outdoor kitchen and staying on budget is more important than potentially going overboard on a larger space you only end up using to host a handful of people. The more efficiently you use your space, the better off your outdoor kitchen will be. Do you plan to serve food in the same outdoor space? Bar seating, kitchen tables, and general seating are integral in planning a successful outdoor living space; but you may not need all of that for your kitchen. Whatever seating arrangement you decide on will have to be taken into account when you install your cooking equipment. Make sure you plan enough space, outside of islands and counters, to accommodate something like stools, chairs, and tables. What sorts of food do you want to be able to cook in the outdoor kitchen? The scale of your meals should definitely influence your selection of cooking equipment. Determine the typical food or meal you’d like to conquer in your outdoor kitchen—is it normal grill fare? A gourmet meal? Pizza? Knowing what you’d like to cook will help you choose the right piece of cooking equipment, and prevent you from buying something you won’t actually use. Counter space is another consideration when thinking about possible meals. Bigger meals will require more prep space. Keep this in mind during the design phase! Do you want to entertain before, during, or after meals? Your answer to this may influence the number of seats you provide for guests in the outdoor kitchen. This answer is also affected by how many guests you plan to entertain on average. 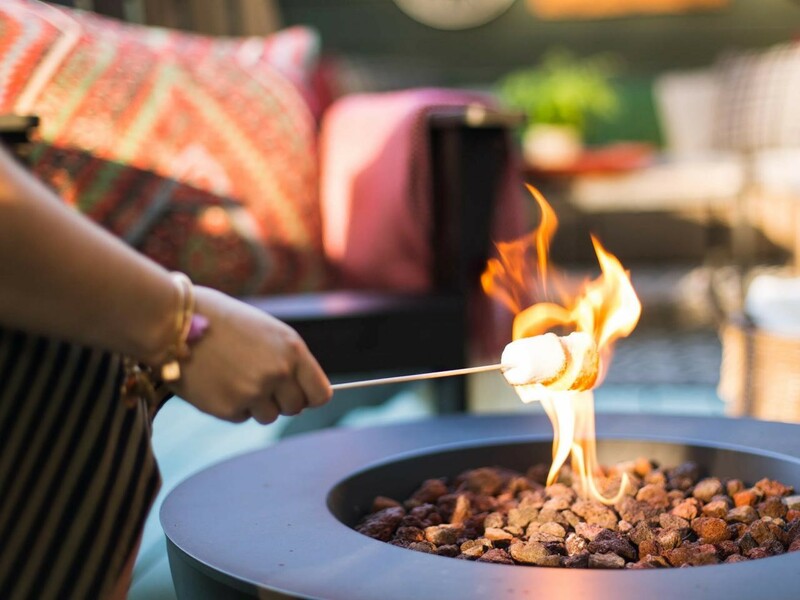 Whether you want guests to relax while you cook, after they’ve eaten, or in between drinks, an outdoor kitchen can easily be turned into an outdoor living space with a few simple modifications. Lighting can open the place up for use at night, while music and a TV entertain guests. This creates a great place to enjoy the Sunday football game or host social gatherings during the warmer—and colder—months of the year. Especially if you’ve installed the appropriate heating/cooling appliances. What supplies or ingredients do you plan to store? One of the biggest benefits of having an outdoor kitchen is having everything you need to whip up a meal in a single spot. You shouldn’t be running back inside your house for spices, utensils, or glassware, because ideally your outdoor kitchen should store all of that stuff for you, too. Jot down a list of everything you think you’ll need for meals, cooking, and serving. When you’re designing the actual kitchen, arrange for cabinet space that will hold these things. Once you have a solid grasp on the kitchen’s purpose and your needs, you can start planning the more specific design elements. Before you start your project, it’s always a good idea to see if you’ll need a permit. There’s nothing worse than getting your vision down on paper and realizing your dream design violates some obscure local building code. Choosing all the appliances is probably going to be one of your favorite aspects of designing your dream outdoor kitchen. Depending on what kind of food you’re interested in cooking, you’ll probably need different kinds of equipment. 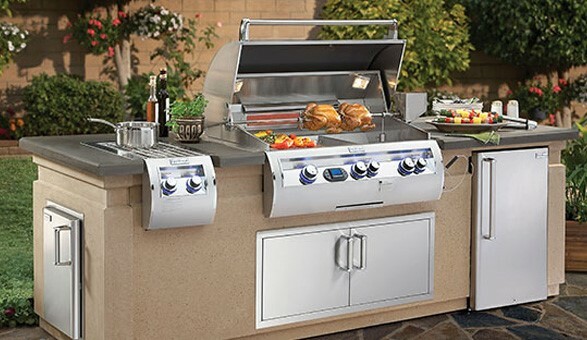 Grills are a common starting point when you mention the words “outdoor” and “cooking.” They come in so many distinct varieties that choosing one might be tough, but here are the most popular grills in today’s modern outdoor kitchen. Gas grills: These grills are all about convenience. They’re easy to refill and light, and the flame is controllable. Charcoal grills: More flavor and the marvel of staring out a live-fire are just two of the reasons people go charcoal. Hybrid fire grills: Combining the features of gas, wood, and charcoal into a single grill, the hybrid grill is a cut above the rest in terms of sophistication and function. Argentinian-style grills: These grills actually have a grill grate that can be raised and lowered to control the intensity of the flame—think a gas grill on steroids. But wait: you don’t have to stop at just a grill. Pizza ovens are kind of a big deal in the outdoor kitchen scene, too. Manufacturers make both wood- and gas-fired ovens, making pizza and bread a reality in your new dream kitchen. Installing one of these is a surefire way to class up the rest of the kitchen and improve its cooking potential. There’s also the option of cooktops and smokers if you want to get serious about the meals you can create. Outside of cooking equipment, there is plenty more to think about, like refrigeration, sinks, wet bars, and other specialty equipment. Out of these, refrigerators and refrigerated drawers, which includes things like wine reserves, beverage centers, keg tappers, and ice machines, are an important factor in how prepared you’ll be in the outdoor kitchen. These provide a way for keeping perishable foods close at hand, and for chilling beverages and ensuring guests have ice at the ready, which is particularly useful if you’re also installing a wet bar. Choosing your equipment will help you figure out how much counter space (landing areas) you’ll need. Landing areas are clear countertop spaces intended to support each station of your kitchen. How much space you dedicate to each landing area is up to you, just remember that it will affect your overall workspace and the utility of each station. Open shelves can be used to create additional counter space in smaller outdoor kitchens, while larger designs have the luxury of simply adding on addition countertops. This space is occupied by grills, pizza ovens, cooktops, and similar cooking equipment, along with the surrounding counter space. A zone dedicated to any kind of refrigerator or refrigerated drawer, freezers, and cold storage spaces. This includes the adjacent workspace. Your wet zones will house the sink and any sink-related storage space, and the adjacent countertop. Any counterspace used for food prep, along with any storage space and cabinetry not being used to support any of the other functional zones. An optimal flow of zones goes hot, dry, wet, and cold. 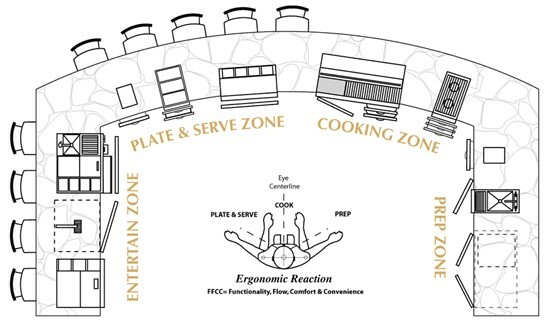 This maintains the utility of each zone by helping each one to work together, allowing you to move from prep, to cooking, to serving, and then cleanup. 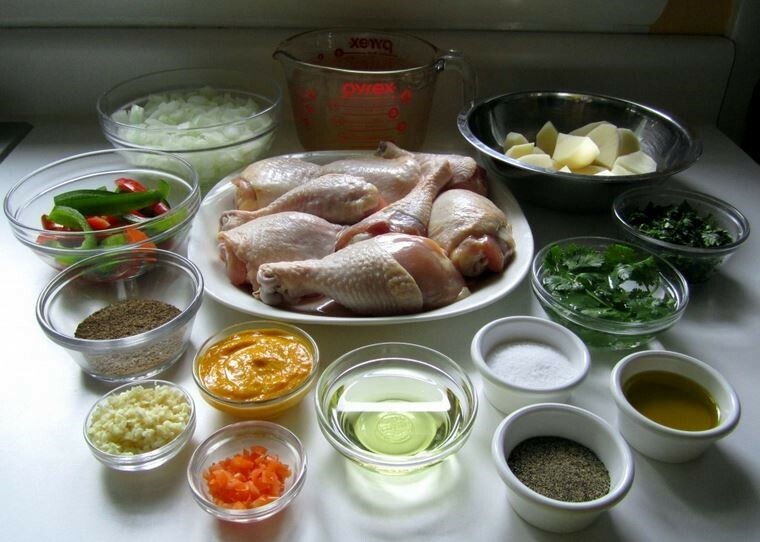 You know what kind of food you want to cook and the equipment you’ll need to do it. You have your landing areas and functional zones mapped out. 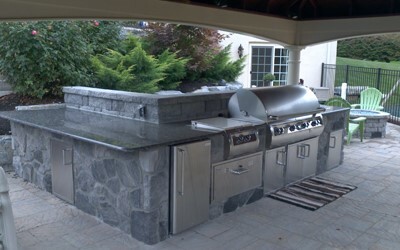 Now it’s time to decide what you plan to do with your outdoor kitchen. Is it for family meals? Will you host weekend banquets for friends? Are you going to throw monthly soirees? Outdoor kitchens can utilize many types of seating, from bars and stools, to lounge furniture, couches, and comfortable armchairs. It all depends on how many people you plan on hosting, and the kinds of get-togethers you intend to have. 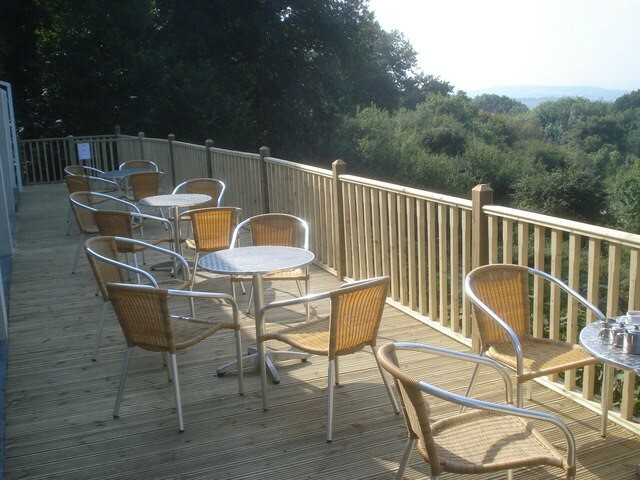 Bars and tables require seating, which require additional space. Details such as seating width, bar-, counter-, and table-height seating considerations, and accessible seating all need to be taken into account depending on your design. With seating out of the way, make room for traffic clearance—the space people can safely pass through without bumping into a station, counter, or piece of furniture. You and your guests should be able to navigate the kitchen comfortably and safely. An outdoor kitchen is more than just a second place to cook: it’s a place to host unforgettable meals. They take the convenience of your home’s kitchen and bring it outside to enhance the experience of throwing a simple cookout a hundred times over.